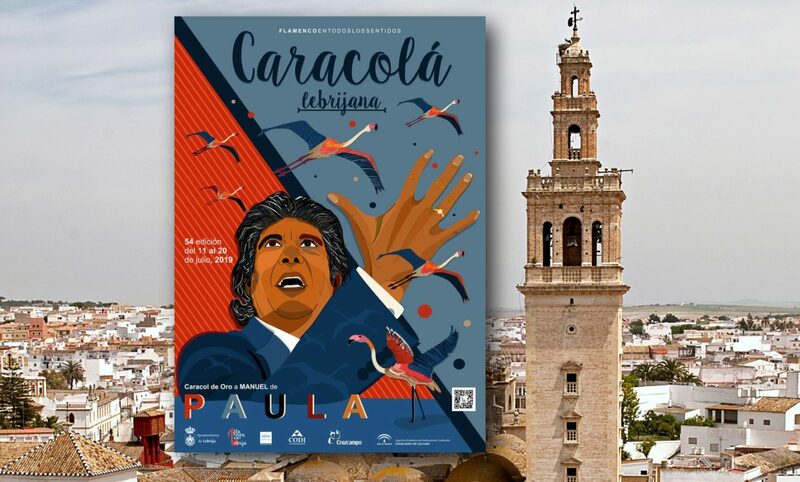 I’m very happy to learn that this year’s Caracolá, the festival of Lebrija, will honor one of the artists of that town with so much flamenco tradition, Manuel Valencia Carrasco, Manuel de Paula, with whom, many years ago, I experienced great moments in private parties together with Pepe Ábalos, Rancapino de Tomares and other great aficionados who are no longer with us. I’ve been following this artist’s career from its start, when he was a teenager but sang like a seasoned old man the styles of his land, which he knew well as he had experienced the flamenco parties in his own family since he was a child. I remember when he was very young, already singing in the summer festivals, not just the festival of his own town but other flamenco events of the Andalusian summer as well. I heard him one evening in the Caracolá festival, singing por bulerías with the greatly missed guitarist Pedro Bacán, and having as palmeros Lebrijano, his cousin Curro Malena, José Meneses and, if I remember well, because I’m writing from memory, Pepe Montaraz. You should have seen the faces of the improvised palmeros, listening enthralled to that son of Ana Carrasco and grandson of La Rumbilla, as he sang the cantes of Antonia Pozo and Antonio Mairena. Manuel was a handsome Gypsy and he had a peculiar voice, a voice of the forges, the tenements, the taverns. Not a hollow, deep voice, but a short, shallow one, with the flavor and scent of Lebrija in every palo, in particular romances, bulerías and tangos. Mario Maya hired him for his dance company, and Manuel was an essential part of it, together with Miguel López. This master of baile once told me: “Manuel is intelligent and sober, [and sings] with no superfluous ornaments”. Mario was always praising him, not just as a cantaor, but as an artist with his own ideas. And even more so as a person. Manuel is among the best people I’ve come across in flamenco, serious, professional, kind, generous and a good friend. He used to live in the Su Eminencia neighborhood of Seville, where I also lived for a long time, and we met rather often when I was directing El duende y el tárab, a radio show broadcasted from the town of Tomares, which I directed for eleven or twelve years. At that time, Manuel was at his best, although the truth is that he didn’t perform in many festivals. He did perform often in the peñas flamencas of Seville province, and sometimes I’d join him with the above-mentioned friends because I liked listening to him up close, among just a few people. I thought he was an ideal cantaor for social gatherings and I enjoyed following him very much. Then he disappeared from Su Eminencia and we seldom met anymore. Due to his return to Lebrija and his wife’s health problems, we grew apart and these days I only hear about him from common friends. Thus, the fact that he was awarded the Caracol de Oro de Lebrija, which will be given to him at the 54th Caracolá festival, has filled me with joy, because I know well how close Manuel is to Lebrija. His cante has the scent of Lebrija and his family has deep roots in that beautiful land. We must acknowledge the worth of the artists when they’re able to enjoy these honors. There’s no need to say that I’ll attend this tribute and show this summer. I certainly will be remembering those years of sincere friendship in Tomares, which was like home for both of us. I’ll be celebrating with him this well-deserved tribute to a long career in flamenco, which is far from over, because Manuel is still a young cantaor.